Over the past 18 months, KPMG, Deloitte, and PwC all launched new web designs. In addition, these websites continue to improve in not just creating locally relevant content but promoting this content on the local websites. This year, KPMG narrowly edged out PwC, based on its very slight lead in languages. Both KPMG and PwC also made it into the top 25 list of best global websites. The goal here is to provide a “toggle” of sorts between languages or related locales. But I’d recommend the toggle be made visible in the header instead. Then you can use a globe icon to link to the full global gateway menu for those visitors who wish to navigate to entirely different locale. On mobile devices, the global gateway remains in the header — which is excellent to see. 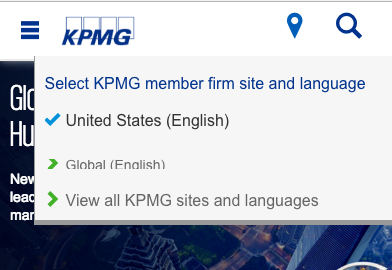 However, KPMG uses a different icon, one that could be viewed as a “location” icon. As I note in the Report Card, this icon is often used to find a physical location, as in a nearby store, so it’s possible that users won’t click on it intuitively to find their local content. To learn more, check out the 2017 Report Card. PS: All purchasers of the Report Card receive signed copies of Think Outside the Country, among other goodies.